The Central Board of Secondary Education, Delhi declared the results of AISSCE 2018 on Saturday, 26 May 2018. Out of 1193 students who appeared in class 12 exam in March 2018, a total of 1140 have passed. The overall pass percentage this year is 95.56 which has increased by 8.64 percent from last year with pass percentage of 86.92. Qualitatively too, with an average of 65.84 percent, there has been an increase of 3.79 percent with 62.05 percent last year. 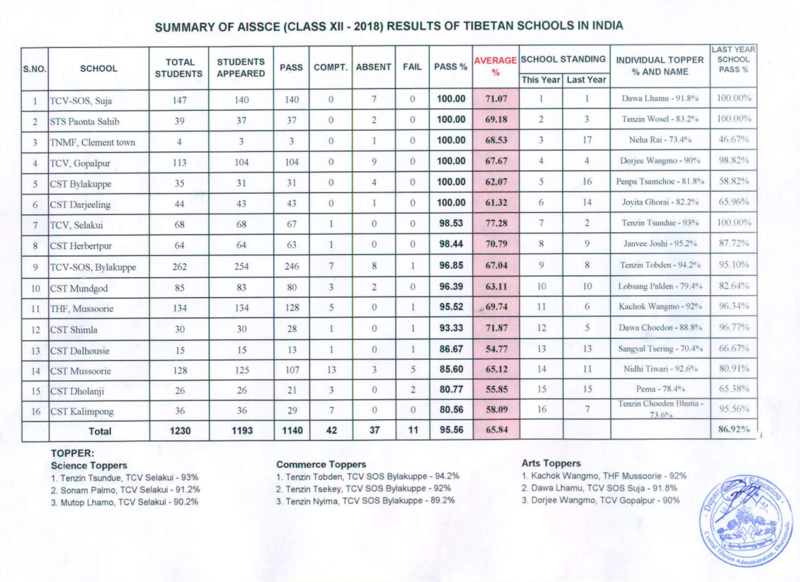 Five Tibetan schools, namely, TCV Suja, TCV Gopalpur, STS Paonta, CST Darjeeling, CST Bylakuppe and TNMF Clement town have produced cent percent result. This year too, the girls have outperformed boys with about 4.24 per cent. The girls have scored 97.59 per cent while the boys are at 93.35 per cent. Kachok Wangmo (92 %) of THS Mussoorie, Dawa Lhamu (91.8 %) of TCV Suja and Dorjee Wangmo of TCV Gopalpur (90 %) from Arts Stream. Tenzin Tsundue (93 %), Sonam Palmo (91.2 %) and Chika Yamasaki (88.2 %) from Science Stream all belonging to TCV Selakui. 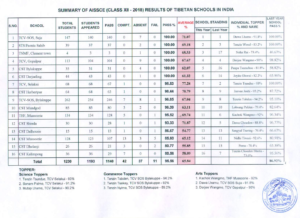 Tenzin Tobden (94.2 %), Tenzin Tsekey (92 %) and Tenzin Nyima (89.2%) from Commerce Stream all belonging to SOS-TCV Bylakuppe. The Department of Education, CTA congratulates all the students who have successfully cleared the AISSCE 2018 and the teachers who have contributed in their success. The one who could not succeed in clearing the exam should not get discouraged as it is temporary and there are many more chances in future.